<em style="font-style:italic; font-variant-east-asian:normal; font-variant-numeric:normal">NY Times</em> and AP botched their Trump fact checks with logical leaps. 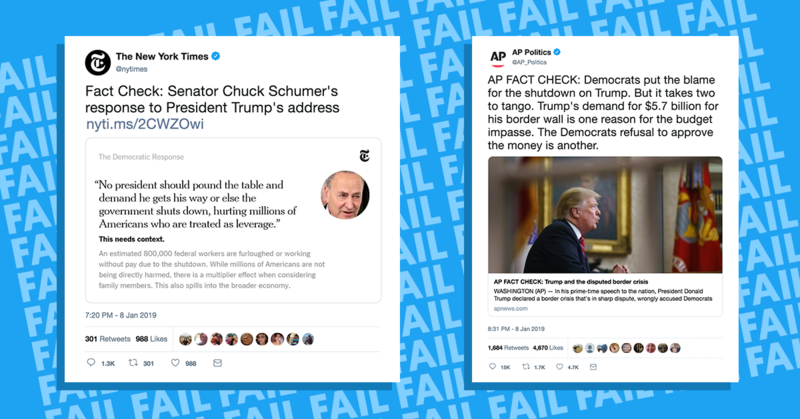 Home > NY Times and AP botched their Trump fact checks with logical leaps. NY Times and AP botched their Trump fact checks with logical leaps. Punditry doesn’t have a place in fact-checking. “Fact-checkers prepare for their version of the Super Bowl,” said Jake Tapper , hours before President Donald Trump would take over network airwaves around the country for a speech urging Congress to approve funding for a border wall, one of his core campaign promises. The short speech, read from a teleprompter in the Oval Office, showed a different side of Trump. Straying from his tactic of peppering his words with wild exaggerations, ad-libs, and lies, he spoke like a more conventional politician. That is to say that yes, he still lied -- a lot -- but he incorporated some facts into those lies, referencing semirelated data to support his argument. If it was fact-checkers’ Super Bowl, it wasn’t a terribly exciting game. There were a few highlights, however. Among other things, Trump falsely claimed Democrats had asked him to build a steel barrier rather than a concrete wall (an alternative he came up with himself), falsely claimed a wall would be “indirectly” funded through his revised NAFTA deal (which has not been approved by Congress and could not fund a wall), falsely said Democrats would not pony up for “border security” (they have offered to pay for various security measures, just not a wall), and misleadingly suggested a wall would be a significant obstacle to smuggled heroin (most of which comes through legal ports of entry). Trump used a series of figures to make his argument that the country is facing a “humanitarian crisis” that can be solved only by building, among other things, a wall along the southern border of the U.S. The issue was that those numbers didn’t actually support the argument being made. For instance, he claimed , “Our southern border is a pipeline for vast quantities of illegal drugs, including meth, heroin, cocaine, and fentanyl. Every week, 300 of our citizens are killed by heroin alone, 90 percent of which floods across from our southern border.” That’s true, but according to the Drug Enforcement Administration , the majority of those drugs are being trafficked through existing ports of entry and not areas that would be affected by the creation of a wall. Fact-checking that statement requires nuance, and for the most part, the fact-checkers at news organizations like the The Associated Press , The New York Times , The Washington Post , and others did the claim justice in not rating it outright true or false. Other statements, however, were more clear-cut, like when Trump claimed, “The wall will also be paid for, indirectly, by the great new trade deal we have made with Mexico.” The trade deal hasn’t yet been ratified by Congress, and there’s no wall-repayment fund or mechanism in place. The claim is false , as was his statement that the wall will be made out of steel and not concrete “at the request of Democrats.” The party’s opposition to the structure has nothing to do with building materials , but with its existence itself. Once again, fact-checkers were, generally speaking, straightforward  in the response to these claims . In fact-checking the response from Speaker of the House Nancy Pelosi and Senate Minority Leader Chuck Schumer, however, journalists took liberties in determining what can be checked. Roughly an hour later, the Associated Press Politics account tweeted that Democratic lawmakers blaming Trump for the shutdown aren’t being entirely truthful because the shutdown could come to an end if they would cave to his demands. During a December 11 meeting  with Schumer and Pelosi, Trump took full responsibility for a potential shutdown, saying that he was “proud to shut down the government for border security,” and adding, “I will take the mantle. I will be the one to shut it down — I’m not going to blame you for it.” Even at the time, the Democratic leaders had been clear on their position: They would not put forward a package that included funding for Trump’s wall. To say “it takes two to tango” without acknowledging that Trump had already taken full responsibility (which he later tried to walk back) for the shutdown, or noting that both chambers of Congress were in Republican control when the government shut down, is factually wrong. More than that, it’s an editorialization, something that really doesn’t have a place in fact checks. In a statement to Washington Post media reporter Erik Wemple, an Associated Press spokesperson clarified that the tweet was meant to highlight that "Democrats have refused to accede to President Trump's demands." It's not really clear whether that's any better. Editorialization and fact-checking’s unclear mission pose threats to the genre of fact-checking. In an ideal world, fact checks would probably simply be part of standard journalism and not a subgenre unto themselves. Fact checks can have benefit as standalone works, but too often they stray from the dry, straightforward approach that makes a good fact check easy to digest in a few quick glances. “It takes two to tango” probably doesn’t have a place in the fact-checking lexicon, if we’re all being honest with ourselves. “The fact-checking genre is fine and useful in certain circumstances but it is *woefully* under-theorized as an undertaking, which leads it into all kinds of weird, shoddy, and dubious territory,” tweeted MSNBC host Chris Hayes  following the speech. Fact-check people should ask, “is this a strict assertion of fact?” And then fact-check the Yes ones, and then if they still want to delve into the No ones, it should be under a different heading. I agree it’s bad when they try to “fact-check” subjective claims. In a 2013 column in the Columbia Journalism Review , Brendan Nyhan warned of fact-checkers whose personal political ideologies turn their work from a demonstration of proof into outright punditry. Nyhan’s article highlighted the messiness of the process and the importance of being able to separate the semantic from the factual and of eschewing unnecessary adjectives. “Factchecking is an inherently subjective enterprise; the divide between fact and opinion is often messy and difficult to parse,” he writes.